Does Snack Girl look like she has time to make meatballs? Look at me up there! I look busy. My children happen to love meatballs, and I have been known to buy packaged ones. But packaged meatballs are expensive and tend to be sodium filled. What I hate about making meatballs is cooking them in a frying pan in batches. It seems to take FOREVER. When I found this “bake on a rack” method, I was psyched to try it. Spray the grate with non-stick spray. Toss grate into sink with warm, sudsy water immediately after finished. The clean-up nightmare that would be this grate covered with baked on meat is enough to keep me awake so just avoid it. This is a very standard recipe with no particularly brilliant angle. Serve these as an appetizer, in tomato sauce on spaghetti, in a pita with lettuce and tomato, etc. Make a bunch and freeze them for later consumption. How do you make meatballs and what do you put in them? Please share. Preheat oven to 350 F. Line a rimmed baking sheet with aluminum foil and place a baking rack on the sheet. 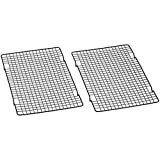 Spray the baking grate with non-stick spray on both sides. In a large bowl, mix beef, onion, celery, garlic, egg whites, oregano, salt, and breadcrumbs until combined. Form 1 inch balls with your hands and place on baking grate until you have 20 balls. Bake for 25 minutes or until cooked through. Serve immediately or store until later. These store in the freezer for one month. I roast my meatballs. I put them in a 13x9 pan in the oven. When I take them out I immediately take them out of the pan and put them on a tray with paper towels to absorb some of the fat. The thought of trying to clean that grate with little bits of meatball stuck to it gives me the shivers ... and not in a good way. I also bake my meatballs (used to fry them, but too much work & added oil.). It really does make a difference to have some fat in the ground beef. 90% lean is OK, but 85% is better - a lot of the fat drains off. Also, you need some salt, as you've indicated - I always try to go light on the salt, but meatballs need some. Make them small - I find that a pound of ground beef will make enough meatballs for 2 meals - one with pasta, the next day for a sandwich. Yum! I use a 9X13 pan and cook my meatballs in the microwave for 6-8 minutes. Rearrange meatballs and drain liquid once after 3-4 minutes. Spray the pan for easy cleanup. My mom has always just baked her meatballs, on foil-covered jelly roll pans. And then you can drain them on paper towels after baking if you want, but they really don't end up super greasy this way. Yum! I definitely will try roasting my meatballs the next time. I make my meatballs with turkey, even my meat eating husband likes them. Using the turkey you also need to add extra seasonings so I also add some garlic powder and 1/4 cup Parmesan cheese to the mix. I tried roasted them without the rack and they didn't have that light crunch on the outside of them. Perhaps I did it wrong - they also weren't cooked through. This method solved my problems. 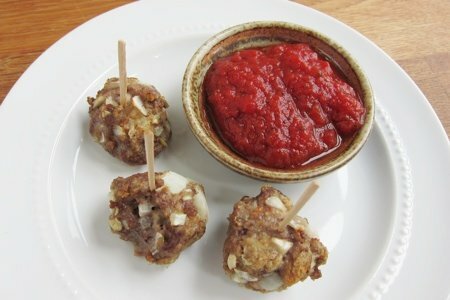 Snack girl, I like the idea of using a rack under the meatballs for an extra crunch. 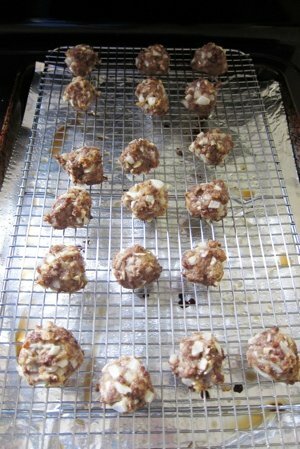 I dabbled with making mini-meatballs which totally entices younger kids and bakes much faster. Forget the canned Spaghetti-Os...just make your own which is much more tasty and healthier! Anyhow When She Was Younger My Mom Used Fractally Roast Them Turn Them During Roasting. Place The Frying Pan On Reserve. Place The Sauted Onions Into The Meat Mixture. Fsbricate (Shape) The Meatballs. In Order To Complete Roasting Them. Frying Pan In Order To Brown Them. Needless To Say It Is A Complicated Procedure. In Her Later Years She Would Simply Fry Them. I make healthy meatballs by the dozens w ease! I use ground turkey which is low in fat. I put the ground turkey in my mixer with paddle attachment. Then I add Progresso Italian bread crumbs & about 1 whole egg per pound of ground turkey. The mixer with paddle stirs it around for me so that I don't have to get my hands into it. Then I use a medium scoop, (like for cookies) & I scoop & drop them on to a greased jelly roll pan. I bake them @ 350 degrees for 45 min. They bake up nice & crispy on the outside with a delicate nutty flavor from using the turkey meat. the Italian bread crumbs give the meatballs all the seasoning my family desires. However, one could certainly add more stuff to the ground turkey if one desires! Oh, & as far as how much bread crumb to use: I pour it into the turkey mix until I am satisfied with the tightness of the texture. My husband makes easy meatballs: 1 lb. extra lean hamburger mixed with 1 egg, 3/4 C Italian bread crumbs. Shape into balls and cook on stove top right in the marina sauce (covered). Within 20 minutes you have cooked, awesome meatballs! Jennifer Y - Our favorite way to make meatloaf is in a muffin tin. We sit our muffin tin on a scale and portion out into identical servings. This provides great portion control as each person gets one meatloaf... there is no grazing on what is left. We freeze them, bringing them out of the freezer for a quick microwave thaw and a reheat in the toaster oven to can't tell they were just made perfection! Gayla, I think the muffin tin is a great idea! my grandma muzzie used to make them adding rice and campbells concentrated tomato soup - she called them porcupine meatballs, a family treat! I make meatballs and put them in clear soup using any kind of stock, add vegetables. You can eat it with rice, or noodles, or pasta. Beats cleaning the grill! I agree with Susan- adding parmesan or Romano makes meatballs so tasty!! That's my mom's secret ingredient! I also use Parmesan or Romano cheese, makes for really tasty meatballs ! I have been broiling them for years ! Makes them nice and browned which my family loves. You can replace breadcrumbs and use oatmeal instead ! I never add salt and they are great !!! I've been baking meatballs for a while. Swap out whole wheet crumbs with Italian whole wheat, add a handful of parmesan cheese, fresh basil chopped and fresh garlic, roll them small and make a great Italian wedding soup with spinach or kale, low sodium chicken broth, carrots, canned white beans rinsed, onions, celery, and some healthy small pasta. Mmm good! I've been making vegetarian meatballs with little mozzarella balls tucked inside of them. My kids love them (and I do too).